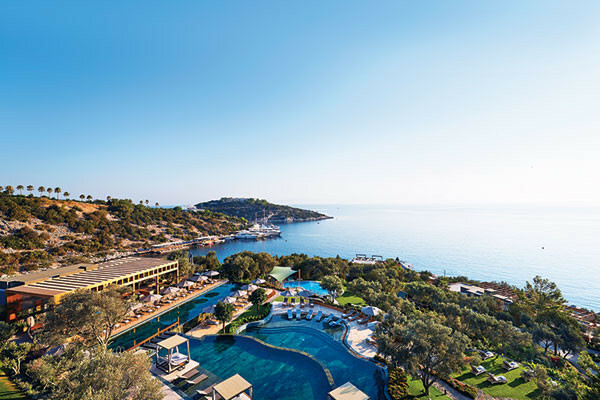 Nestled on verdant terraces dotted with restaurants, bars and cabanas, right there on the Turkish Riviera, is Mandarin Oriental Bodrum, set on the northern coast of the Bodrum Peninsula at Cennet Koyu or Paradise Bay. This fabulous luxury resort is a five-minute drive from the popular waterfront town of Golturkbuku and a 45-minute drive from Milas-Bodrum International Airport from where several airlines operate a 60-minute flight to Istanbul. You can of course also arrive by your yacht or private plane to this popular destination of jet-setting travellers. 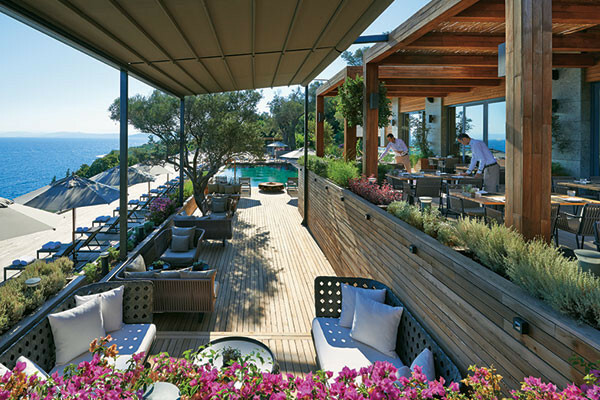 Enjoying a hillside setting offering superb sea views across two kilometres of Aegean coastline with access to two private, sandy beaches, this hotel marks the highly anticipated debut of the award-winning hotel group to Turkey and is located on a 60-hectare waterfront site, on a hill surrounded by ancient olive groves and pine trees. After sighing over the magnificent open-air lobby that seems to extent right into the sea and a quick check-in, I sigh some more at the large, airy and well-appointed room that I am shown to, with its stupendous sea-view from a private terrace. This is sheer bliss, I decide. 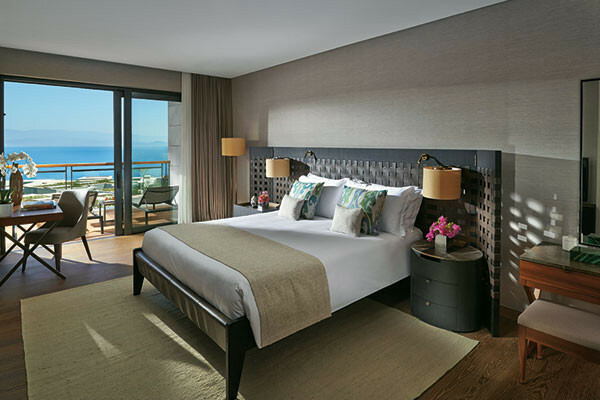 International designer Antonio Citterio has created the resort’s 109 guestrooms and suites in a 21st century contemporary style, providing the absolute feeling of being at one with nature. Design elements have been influenced by the Group’s oriental heritage as well as from local cultural ancestry. The Sea View Rooms and Mediterranean Suites are spacious and flooded with natural light. Outside terraces offer a dining area and sun beds. The suites blend into a private outdoor terrace featuring a plunge pool and outdoor shower with spectacular views of the Aegen Sea. 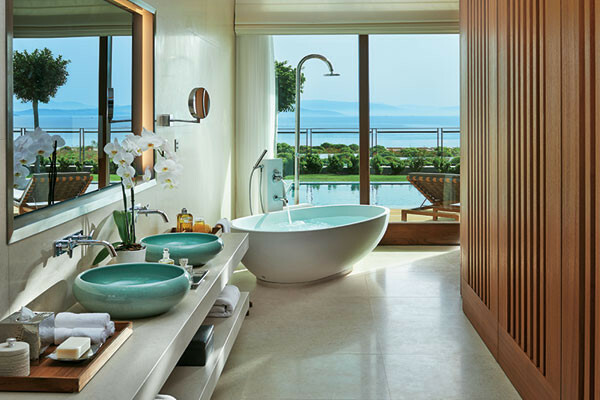 The view includes The Residences at Mandarin Oriental dotted on the hillside, 196 luxury private homes, built to unrivalled standards in Bodrum. Lunch at the all-day dining restaurant, Sofra, where we also indulge in an impressive Turkish breakfast, includes some delicious, grilled local octopus, pan fried rolled chicken cooked to tenderness and a ginger crème brulee. An enviable list of 10 restaurants and bars dot the property, most offering spectacular views. Assagio is a specialty Italian restaurant serving authentic, heart-warming regional cuisine. Kurochan offers contemporary Japanese cuisine in an impressive setting. The Olive Garden serves delectable Turkish cuisine, providing an al fresco dining experience under the olive trees. The tranquil Terrace Lounge and the Mandarin Cake Shop provide a relaxing afternoon tea with homemade gourmet treats, while the stylish Blue Beach Club & Bar and Pool Bar & Restaurant serve tapas, mezzes and cocktails. With its impressive beachside setting Juju Bar @M2 is the place to be for relaxed daytime dining and evening performances from renowned local and international DJs on its spacious waterfront decks. The contemporary Mandarin Bar serves enticing cocktails presented in a chic environment. The afternoon calls for a visit to The Spa at Mandarin Oriental, Bodrum. Built on a hillside ridge overlooking a lush valley and the Aegean Sea, the 2,700-square-metre spa features 12 treatment rooms, including VIP spa suite, Orkide, and a Couples’ Spa Suite as well as two outdoor cabanas with expansive terraces set in the cascading Mediterranean landscape. Further facilities include significant heat and water therapies including hammams with private scrub rooms, an indoor swimming pool and an outdoor vitality pool. Extensive fitness facilities are also on offer, including a dedicated studio where guests can practice Pilates and yoga in private or group sessions. Besides, the water sports centre offers a wealth of activities from scuba diving and snorkelling to sailing and fishing. Sports facilities include two tennis courts and a basketball court, a jogging path circling Paradise Bay, and an array of swimming pools. We are informed by director of communications Lara Niksarli, that dinner is going to be a surprise. We are agog with guessing what this could be. Fetched from the main lobby, and transported along in the dark in golf carts, we arrive at the magnificent Presidential Suite, with its gardens and pool lit with candles. After a selection of excellent starters, we get into a pumpkin soup with a fried egg yolk in it, ink risotto with squid, sage and turmeric cream, pan fried turbot and the highlight, an amazingly light limoncello soufflé with raspberry coulis. It has been such an excellent evening and meal and of course, the chef has to come out and take a bow. We talk into the night, dreamy with good food, happy in fabulous surroundings, wishing this would never end. Blessed with a rich cultural history, a temperate climate, some of the finest food in Turkey and timeless natural beauty, Bodrum is one of the favourite Mediterranean destinations of today’s discerning travellers. Bodrum’s centre has a lively city vibe throughout the year and offers world-class dining options around the marina and an impressive nightlife along the cobbled pathways of the ever-popular Bar Street. Serious shoppers will enjoy the many outlets lining the busy narrow streets and displaying everything from leather goods and decorative items to jewellery and high fashion brands, while there are also local markets for fresh produce, and bazaars for handmade crafts. In addition to neighbouring coastal villages, the southern side of the peninsula boasts various fashionable coastal hangouts as well as 18 diving sites with crystal clear waters. Described as ‘the land of eternal blue’ by Homer, Bodrum is also an open air museum and home to many remarkable sites of ancient Halicarnassus –today’s Bodrum.